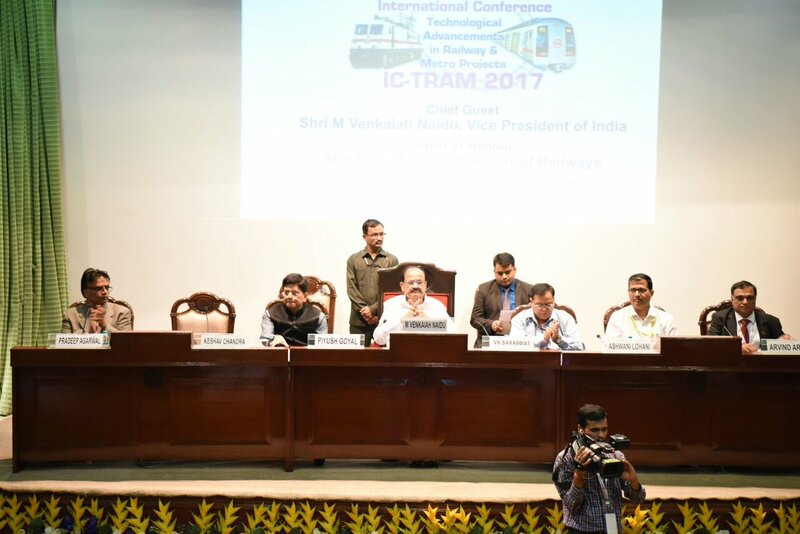 New Delhi: Hon’ble Vice President of India, Shri Shri M. Venkaiah Naidu inaugurated an International Conference on Technological Advancements in Railway and Metro Projects (IC-TRAM 2017) and an Exhibition on October 6 – 7, 2017 at New Delhi. The conference Minister of Railways & Coal, Shri Piyush Goyal also addressed the conference. The Conference has been organized by the Defence Infrastructure Planning & Management Council(DIPM), the Ministry of Railways, the Ministry of Urban Development and the Niti Aayog. The Chairman, Railway Board, Shri Ashwani Lohani, Member, Niti Aayog and Chief Patron of DIPM Society, Dr. V. K. Saraswat, and other dignitaries were present on the occasion. The Vice President said that the Indian Railways need to plan for a massive expansion very meticulously with forward looking, efficient technologies and innovative practices currently available across the globe and adopt them to serve our country’s aspiring population. He further said that the IT revolution sweeping the world, to which India has also been a major contributor, is bound to improve the efficiency in signaling, communications and safety and help in areas like intelligent transportation systems.